Hi, friends and welcome to the NEW Love + Specs! If this is your first time popping over to the blog since last week, you may have noticed that we've gotten a little "work" done and had a beautiful, functional, super fun facelift! So take a look around, check out all of the cool things we have waiting in the sidebar for you, hop over to our different categories and stop by our "Shop" page! We hope you love it as much as we do and find it more functional, fun and easy to navigate than our old look, but if you don't, we absolutely want to hear about it. So make sure you drop us a comment here in the comments section or DM us on Instagram and let us know what we could do better to make your experience here on the blog 100% awesome. Growth is always our goal, so bring the heat! The rollout of the new design has actually been about 8 months in the making, and we've worked extra hard on the weekend, at night and in the morning before work to make sure that all of the functionality we've been wanting here on the Love + Specs comes to fruition, and we're really happy with the outcome. We'll continue to tweak the site and make improvements as things pop up, and we're currently continuing to update our archives and make them easier to navigate and enjoy for years to come. So if you notice little things changing in the coming weeks, don't be alarmed! It's all for the greater good, we promise. Ok so now that that's out of the way, I have to know - was getting back into the swing of things as hard for you as it was for me after the holiday? I just got home from an incredible week spent with my awesome family up in Northern Michigan, and I feel like I've been in a fog for the last couple of days ever since I left and came back to this oven we call Phoenix. I was so excited to get home and see my guys (Chris and Hamlet, of course! ), but I think I was a little misty eyed saying goodbye to my parents on Sunday. Is that weird? I just can't tell you how much I love those two. I wish they could live in Arizona year round instead of just a few months in the spring, but who would hold down the fort in The Mich if they did?! Conundrum! On a pretty hilarious note, you'll all be happy to know that my fantastically talented and gorgeous mom Anna stepped in for Chris last week and snapped these pics and the pics from last week's post, and it totally felt like I was back in 3rd grade and she was helping me make that DIY goose costume so I could be the best Goose I could be in our elementary school's rendition of Charlotte's Web. Fun and funny all at the same time! But I'll take any excuse to hang for a few extra minutes with my mom. She's the best! 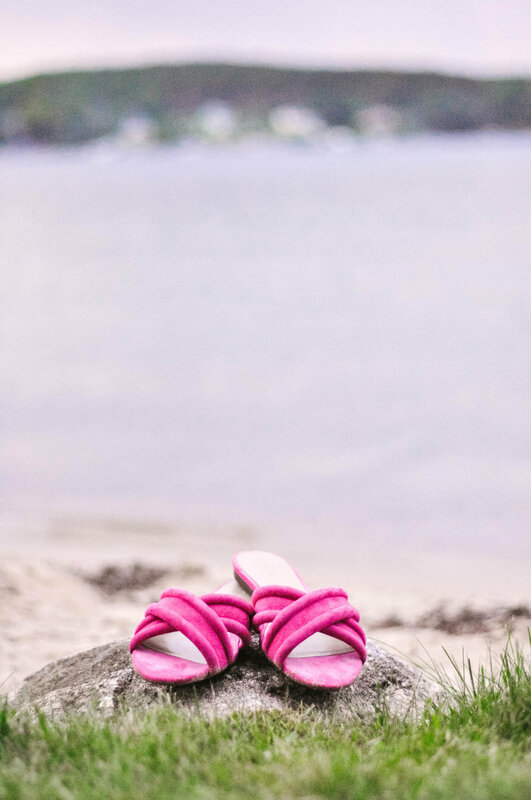 We snapped these on the beach at the lake house on Walloon Lake, and just looking at these is making miss everything about that place. On this particular evening it was just before sunset at about 9:15pm (I know... it's insane to me how late the sun goes down there in the summer!) and it had been raining on and off for a few hours, and we got a tiny break from the rain to enjoy the last of the sunlight and the glassy, calm lake. It was a little dark, a little stormy and pure magic. I snagged this breezy embroidered white bib top from the Zara sale for under $20 right before I left for Michigan, and it was a major score... although sadly it has sold out in the short time since. But the Zara sale is still going strong and there are plenty of gems in there to go around. I still have about 5 things sitting in my cart just waiting to be mine, so I need to get on it before it's over! 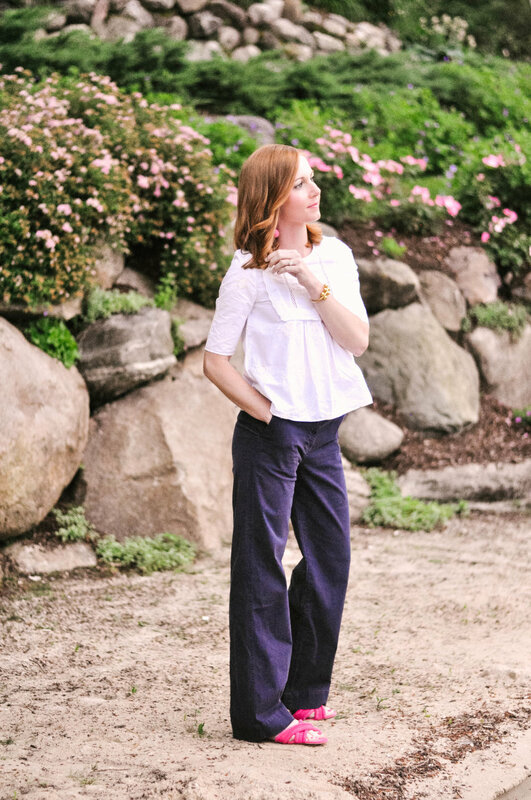 I've styled these pants Here on the blog before and I have to say that although they may just be a plain old classic chino, they're one of my absolute favorite pair of pants in my wardrobe right now because they're so stinkin' comfortable. No kidding - the fabric is so soft I could sleep in them. So it only made sense to bring them along for a relaxed lakeside week where comfort was key. These are almost sold out at J.Crew, but I've linked a bunch of other similar options in the roundup below, as well as some of my favorite bib tops! 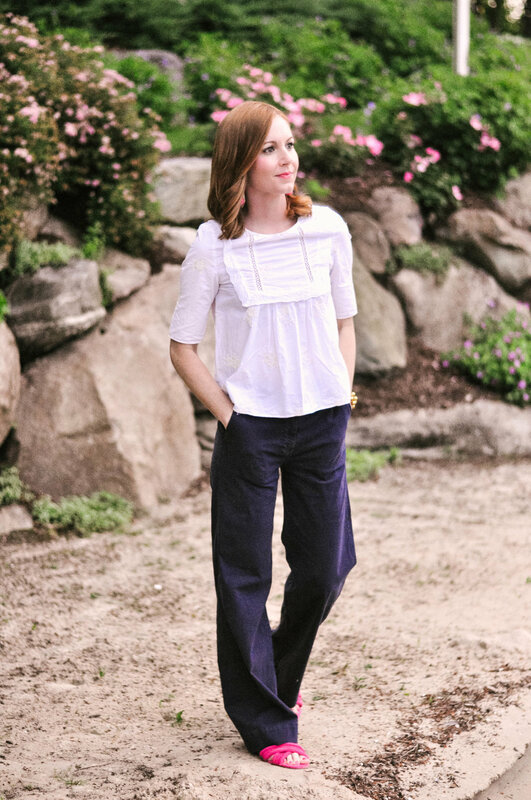 I'm kind of loving the bib top trend that's been happening lately, and there are so many variations to choose from. I love how playful and a little bit bohemian this style can be like the one I wore here, or polished, put together and menswear-inspired they can be when they're done in a button down style. PS does everyone know that it's Prime Day on Amazon? You all know how strong my love is for all things Amazon Prime, so if you're looking to score a serious deal on a TV, an Amazon device or any other items, now's your time!